If you use an AHA (alpha hydroxy acid) or BHA (beta hydroxy acid) exfoliant, you’re happily familiar with the visible benefits each provides. But, can you use them together? Yes, but whether you should do that depends on your unique skin concerns. There’s an art to combining them to see the best results, not to mention some amount of experimenting. We share our tips on how you can easily do that! Using an AHA exfoliant and BHA exfoliant at the same time (both provide what’s known as chemical exfoliation, rather than the “mechanical” action of a scrub) is not as complicated or scary as it might seem. If you’re choosing well-formulated, gentle exfoliants, there really isn’t a downside—you just have to watch carefully how your skin responds and adjust your routine if needed. Should You Use AHA and BHA Products Together? Paula’s Choice AHA and BHA exfoliants are formulated to work brilliantly on their own, but you also have two other options to exfoliate your face: (1) apply them at the same time, either morning or evening, or (2) alternate their use. The question is: Why do that? Followed closely by: How do I do it to get the best results? The reason for using an AHA and BHA exfoliant at the same time is really about whether or not your skin needs more thorough exfoliation. This might be the case for those who have advanced signs of sun damage, deep wrinkles, stubborn clogged pores and bumps, or dull, flaky skin. You don’t need to use both an AHA and BHA exfoliant at the same time out of fear that you’re “missing out” because one is more anti-aging than the other. In truth, both provide anti-aging benefits; they just go about doing so differently. As for how to use both—apply the exfoliants after cleansing and toning, one after the other. Apply the exfoliating product with the thinner texture first; so, you’d apply a liquid texture before a gel or lotion texture. You don’t need to wait for one to absorb before applying the next, and you can immediately follow with the rest of your skincare routine. Should you apply an AHA and BHA exfoliant at the same time twice per day? Probably not. Most people don’t need that level of exfoliation, but experiment to see what combination and frequency of application work best for you. See what we mean about the need to experiment? Alternating between AHA and BHA products to exfoliate your face might seem to be over-complicated, but it doesn’t have to be that way. It’s fine to alternate, and it can be a great way for all skin types to experience the distinct benefits of each. 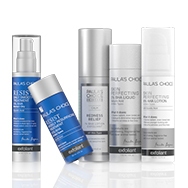 In fact, many people find that alternating AHA and BHA exfoliants is the perfect solution to address their unique concerns. Most people do fine exfoliating once daily, morning or evening based on personal preference. If you have advanced signs of sun damage, clogged pores, or bumps, exfoliate twice daily. If you want to alternate an AHA and BHA, simply decide which exfoliant to use at the beginning of each week and then go back and forth day by day. You can also alternate each week. One week is once or twice daily application of an AHA, the next week do the same, but with a BHA exfoliant. Another option is to apply one type of exfoliant in the morning and the other at night. This can be a great approach for breakout-prone skin showing signs of sun damage. You also can experiment by alternating different strengths of an AHA or BHA—or both! For example, apply a 1% BHA exfoliant each morning and step up to a 2% strength at night. Once or twice per week, rotate into your routine a higher-strength specialty AHA or BHA treatment to give yourself an “at-home peel” experience that delivers more dramatic results. Ultimately, be aware that there’s no single best way to go about using AHA and BHA exfoliants. As long as you have gentle, effective products, skin exfoliation is about experimentation and fine-tuning your routine as needed to ensure you’re seeing only superior results.